The Cover: I go back and forth between loving and disliking this cover. I love the girl. I think she looks lovely and innocent and not so innocent at the same time. The guy however... who said this was a zombie book? He just looks... wrong. I am not sure why they made him all shadowed, but I think it makes him look gray and undead. I seriously had to check and make sure this wasn't a zombie book before I requested it! Characters: I liked Anna. I thought it was an interesting touch that she had a memory that went the entire way back to the womb. I like Kaiden and the relationship that they developed. It developed slowly and organically- it didn't feel rushed or fake. I also enjoyed the other demons. I liked that they had personalities and ... to be ironic... souls. 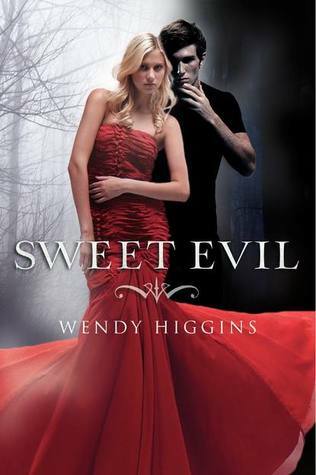 Plot: Sweet Evil is very different from other Angel/ Demon books. The author has created a completely new and complex world where demons have an entire underground system of "working" with humans. This was like demons meet The Godfather. I really did enjoy it! If you enjoy paranormal romance without a love triangle- you will most likely really enjoy Sweet Evil. Yay no love triangle lol. I might check this out :) Thanks for the review! Having seen this book around several other places I wasn't sure. Great review though I think I will have to check it out! No love triangle and no insta-love! Hurray! Nice review! I'm glad you enjoyed this. :D I'm reading it pretty soon, and I'm hoping I'll love it. Maybe the love triangle is getting a bit beat down since so many of us are not exactly interested in jumping into a love triangle book lol!!! I just won this one in a contest and I am excitedly awaiting its arrival. I'm with you on the cover. It looks a little, I don't know,.. odd. Yep, I will go with that. But the story itself looks very interesting and I am most definitely interested. I hope that it doesn't disappoint. So many books that get rave reviews end up not living up to those reviews and it stinks. Anyway, thank you for your review. I really like how you break it down into parts. It helps distinguish good from not so good a lot easier!